I made a special trip to Boston earlier this week. The purpose of the visit was partly to see friends and family, but the timing was coordinated with a book tour by one of my very favorite authors of all time, Jeanette Winterson. On Monday night I heard her read from her stunning memoir, Why Be Happy When You Could Be Normal?, though in her reading/talk she called it an experiment rather than a memoir. 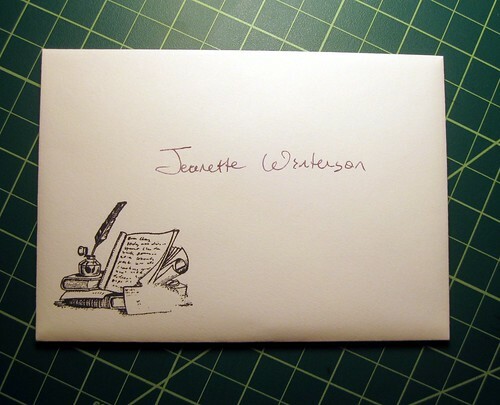 I have often considered writing a letter to various authors (I've even blogged about such contemplation in the past), generally just to praise their books and say how much they meant to me. Surely writers like to hear that? And I would suppose they would appreciate the charm of a hand-written letter instead of an email? I don't know for sure, everyone is different, of course... but I had never written any author before. Part of this was because the prospect is daunting, and part is because I wanted to write to Jeanette Winterson before anyone else. I was so excited when I read that Boston was included on her 10-city tour to promote the new book, and even more excited when it actually happened at a time when I could attend! 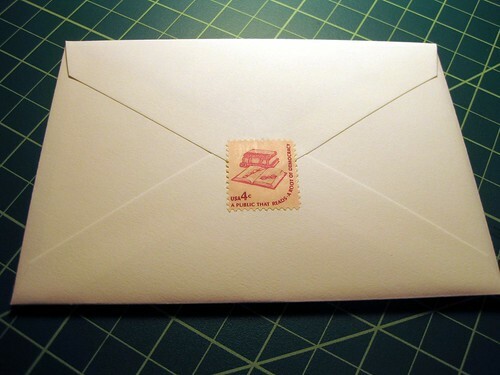 The opportunity to hand-deliver a letter to her finally prompted me to write an intense and intensely thankful letter. I wasn't sure I'd actually give it to her until I did, but we waited in line to have the book autographed, and I handed her the letter after she signed our book. It was a pretty fast-moving line (and a long one!! We waited a long time! ), but she did ask me how to pronounce my name and where it came from. I don't know if she even read my letter, but she took it, and I hope my bumbling letter is more of a gift than a burden. I know she is very famous, but her books changed my life and I wanted her to know it. Oh that is just so awesome! I love Jeanette Winterson's work that much too. "Oranges are not the only fruit" remains a favourite of mine. Loved it! i thinks that it's wonderful that you handed a favorite author a handwritten letter about why her books are meaningful to you! Bets that the first thing she read when she got back to her hotel room?! Plus it's a good thing to keep and feel good about her work. I'm sure she'll treasure it!! Barbara - I'm not sure she'll treasure it, or even read it, but I'm still glad I wrote it and gave it to her.